On the San Francisco docks back in the old days, the longshoremen’s vocabulary included the term “Portuguese lift.” This was at a time when the stevedore’s work was only partly mechanized, so much of the hauling and pulling – and lifting was done manually. The slanderous phrase referred to workers who didn’t quite shoulder their fair share of the load while seemingly doing so. It was supposedly a way to lighten what one had to do while leaving to others the larger share of responsibility to get the job done. Colloquial ethnic insults like that were common through the forties and fifties. They gradually faded from common use as we became more enlightened and tolerant of others. These days, of course, they are making a comeback as Trump and his minions work overtime at arousing bigotry in every form. – with considerable success. As for the “Portuguese lift,” the attitude and work ethic it connotes is thriving. They long since have left the containerized docks to become commonplace throughout society. Regulators at the SEC and FTC go through the motions of regulating – but don’t quite. IT companies pretend to provide service for your internet and telephones – but don’t quite do it. McKinsey et al nominally audit the big 5 banks – but do a pale imitation of auditing. These manifestations are more subtle and varied. It is not just a matter of shirking; that’s banal and commonplace. Something that always has been there. Far more noteworthy, and significant, are the cases marked by a pretense to perform a function while actually short-changing supposed partners/beneficiaries. This may be done wittingly, only semi-consciously or out of sheer habit instilled by the cultural and/or institutional environment. News media and personalities provide the most egregious, and harmful examples. The harsh reality is that the coverage of events and developments is routinely abbreviated, deformed and skewed. Reporting without really reporting. That is done to serve two purposes: to protect or advance the interests (material, political, ideological) of those who derive the most gain from the status quo; and to thwart the public’s ability to develop critical skills essential for understanding and interpreting the machinations going on around them. The culprits are everywhere. 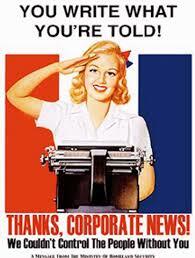 They include news sources that advertise their integrity and sobriety – e.g. The New York Times. Let’s concentrate our attention there (and on other ‘elite’ venues) since their consequences are the most dire. One insidious practice is what may be called “Gospel writing.” This is the editorial practice of stating – or even leaving as unstated assumption – asserted verities that in actuality are anything but eternal truths. Stigmatizing Russia as an implacable enemy of the United States which threatens everything we cherish is the outstanding case in point. This fictitious construct is built on a set of more specific assertions/assumptions lacking solid factual basis. Typically, a form of circular reasoning uses the “gospel” to validate those propositions, and then those propositions brought forth to validate the “Gospel.” This illogical mode of non-thinking is at once dishonest and lazy. Let’s say that the jobs to be performed are: 1) to determine what exactly has happened in Ukraine, in Georgia, in Syria, in regard to Ballistic Missile Defense, in regard to interference in each other’s political life; 2) to appraise purpose and motivation based on an objective reading of what transpired; 3) to clarify cause-and-effect from the interaction between the parties; and 4) to devise a foreign policy based on a clear statement of national interests, a systematic examination of options, and a weighing of risks as well as opportunities. This manifestly is not being done inside the Trump administration. It manifestly is not being done inside the establishment think tanks. AND it manifestly is not being contributed to by the news media. The last have the function of serving the public not by replicating what the agencies of government should be doing. But rather they should be critically looking at, and reporting on specific developments distorted in official readings, and used as building blocks to reach pre-determined conclusions. They do not do that. It is years since any major news outlook as much as mentioned that senior Obama administration officials were in Kiev instigating the violent overthrow of a democratically elected government – the original sin from which all else has followed. Never has there been skeptical questioning of the official line that it was Russia that attacked Georgia in 2008 when it was the other way around – just ask the American army officers who designed and guided the plan’s implementation, listen to the former Georgian Ambassador to Moscow speaking to Parliament in Tblisi, ask the Deputy head of the U.N. Mission on the ground in Georgia. That is very easy to do. I did it – without even leaving my office here on the prairie. The American press refuses to go in that direction. The same can be said of the think-tank/foundation world. Rather than plunging into those deep waters, they rest content dog-paddling at the shallow end of the pool. What we are observing are two phenomena. One is the ease with which official Washington manipulates a pliable press. The other is the pervasiveness of the “Portuguese lift”: mentality among the press, our pundits, and our commentators. It is far easier, and far more career savvy, to cut-and-paste reporting and to spout hackneyed clichés. You lift but don’t quite lift. On the waterfront, it was your fellow workers who made up the slack. On the news front, there is no one else to do the job you’re responsible for – except for marginal types. So the task is not performed at all. Consequence: the shipping crate drops 25 feet onto the pier and splits open – ruining the contents. That is exactly what’s been happening to public discourse in the United States. Certain P…L variants are peculiar to the media news. There is the “Comet,” for example. That is a story that streaks across the horizon emitting a stunning glare for 24 hours. It then disappears – leaving behind little more than faint traces of memory. The ephemeral nature of the event is not due to its insignificance; indeed, it may have great intrinsic value. Rather, it goes largely unremarked because it reveals truths that have been concealed, ones whose exposure make some powerful people very uncomfortable. Let’s think of the ‘blockbuster’ story broken by the NYT last month about the secret army organized and directed by the CIA in Afghanistan which has been rampaging across the country – leaving destruction and hatred of America in its wake. This was news – seemingly big news. After all, President Barack Obama had held a solemn ceremony on the White House grounds exactly four years ago to lower the flag on our military involvement in that benighted place. (Obama was the slickest of P….L artists – forever preaching the spirit of collaborative effort yet never quite able to work up a sweat himself). Yes, it was understand that we would leave behind a few thousands American troops to train elite units of the Afghan Army, to provide logistic and Intelligence support, and likely to steel the government forces by conducting tactical air strikes. Those activities supposedly were the Pentagon’s mandate. Now we learn, the CIA is running its own independent war – as it has non-stop since October 2001. It recruits its own mercenaries (Afghan and foreign), it sets its own missions, and it uses its own methods. The last include wholesale killing with few if any restraints which routinely leads to atrocities against civilians. They do hurt elements of the Taliban, apparently, while winning for the Taliban the allegiance of the many villages we have victimized. It remains obscure to whom – if anyone – these Rambos are accountable. How the CIA’s private war fits into our official Afghan strategy is equally obscure. One might except that the long, detailed story would set off a hot debate. If not quite a firestorm, then at least as much attention as that account of a female staffer in some Sanders For President office back in 2016 who felt that she was made to work in a gender hostile environment. No – not on your life. The expose of CIA murderous mayhem disappeared as quickly as it came. It didn’t even last through the standard 24 hour news cycle; it was relegated to the status of a filler item; none of the preening Democrats dreaming to be the next amateur Chief Executive said an audible word. Some might argue that it is not the paper’s job to do more than report – that a multiform strategy to promote an issue is out of a character. In fact, it is not at all out of character for The New York Times. Its promotion of arch feminist issues, or LBGTQ issues, is relentless. So, too, its promotion of certain favored public persons: Hillary Clinton, Nancy Pelosi, Mario Cuomo, General Mattis and Michael Bloomberg among others. They don’t get the Portuguese Lift. Quite the contrary, they get shoved down our throats ad nauseam. Contemporary Western societies have devised more ingenious versions of the P..L. Consider the ‘Task Force.’ TF is the ideal type Portuguese Lift. This method of evasion is favored in elite institutions like universities, professional associations, charitable foundations, and similar high-minded places. The point of a Task Force is to do nothing while appearing to do something – especially at the usually fraught moment that it is inaugurated. A TF connotes earnestness. Hence, beloved of high administrators sensitive to their reputation for probity, fairness and dedication to their institutions’ well-being. Most common triggers to the formation of a TF involve a clash between groups, factions, interests and/or principles – all of which are accorded respect. Examples include: sexual harassment; diversity issues; LGBTQ rights; the organization’s involvement or non-involvement in politically charged activities (e.g. boycotts of various sorts). Another trigger is heightened saliency of a gnawing and growing source of widespread – if low-grade – discontent: serial incidents of corruption in the athletic department; favoritism in selecting preferred student loan companies; rising tuition; etc. Academic leaders are allergic to making crisp decisions on such matters for an array of reasons. Doing so likely will sharpen criticism by the disgruntled ‘losers’; they have no particular convictions of their own beyond holding onto their coveted office; alumni donors must be assuaged; boards must be assuaged; and a public image maintained of rectitude, fairness and being with the times while simultaneously upholding traditional values. Besides, decisive action is not in the DNA of leaders who gained their exalted position in part by assiduously avoiding it over the course of a career. The Task Force provides the perfect ‘out.’ It postpones making judgements (above all); dates for completion of the TF’s work are set generously well into the future; the mandate is cast broadly enough as to provide ample room for fudging; and the panel’s ‘inclusive’ membership exudes the sweet odor of community. What the TF comes up with, eventually, is largely immaterial. Most have forgotten what the triggering event(s) even was, passions (already tepid) have cooled further, and other concerns have displaced the original ones. TF reports conform to this situational logic. They are long – very long, prolix, impenetrably dense, conclude with a grocery list of recommendations and options, and avoid like the plague taking to task any individual. Almost no one reads them. That’s not surprising since the authorial collective never intended it to be. A clever final twist is to emphasize the value of a continuing “conversation’ among all members of the institutional community. TF has been cultivated in the United States – its native soil. Still, it has shown itself adaptable to a wide range of climates and environments. Where would NATO or the European Union be without Task Forces – however named? In the former organization they serve ably to obscure the fact that nothing is being done at great investment of time and energy except to validate whatever a Washington administration wants to do anywhere in the world. In the latter, they are the all-purpose Swiss Army knife that blunts conflicts 7 different ways. And then there is England. The English have a legitimate claim for being the ancestral home of the TF – but they call it by names redolent of tradition. ‘Royal Commission’ is favored for the big stuff – I believe. The concept, and the purpose, is analogous though. Royal Commissions are burial parties. With all the trappings at the Cathedral and a discrete disposal in some anonymous plot – after many long years. There certain discernible differences. In contrast to the TF, the Royal Commission – or Board of Inquiry – prefers to restrict membership to reliable pall-bearers. Heads of these distinguished bodies seem to make a career of it. On (blessedly) rare occasions some vexing party is ill-mannered enough to loudly remind all-and-sundry of the date – of the century. The scripted response is to huffily reject the insinuation that rigorous impartiality and search for the Truth was not the sole aim of the solemn undertaking, and to make a few modest adjustments in the tone of the RC. The Royal Commission motto is “Slow March.” No rush to judgement. The mill of justice grinds slowly but finely – especially so when the matter to be buried is a weighty one. Hence, the Chilcot Commission* – a Board of Inquiry established by Prime Minister Gordon Brown to examine the hanky-panky (not at all a tony term) that took Britain into war in Iraq alongside Uncle Sam and into an ignominious occupation. Brown’s motive was transparent: to demonstrate responsiveness to growing outcry about the dishonesty of the Labour government in inveigling the country to accept an unwarranted war that the country didn’t want; and to shift the blame onto Tony Blair who had been leader of that malodorous operation. Chilcot (Sir John) got around to issuing its report in 2015 – 6 years being a record of sorts for a swift grinding of the Truth. It also kept to tradition by softly rounding the edges of every quasi-assessment and judgment. Anyway, by 2015 the country had moved on to other blunders in the Middle East – Libya, Syria, Yemen – which dulled memories of the Iraq fiasco. They, in turn, may well be the subject of yet other Royal Commissions/Boards of Inquiry – whether Sir John Chilcot himself will be available to chair them or not. Chilcot’s standing near the top of the league table for lethargic inquiry may be challenged by the on-going investigation of the Grenfell tragedy-crime. Headed by Sir Martin Moore-Bick, Q.C., after 18 months it manifestly has accomplished nothing. That is a singular achievement since almost all the pertinent facts were known and documented within weeks. That covers: causes, response, sins (possible crimes) of omission and commission by the Chelsea and North Kensington Council, successive governments, shady contractors and managers, and callous mistreatment of surviving victims. How the panel is occupying itself is one of the minor secular mysteries of the age. Only Google knows. Clearly, though, it is serving the overriding political purpose of dragging out the proceedings in the hope that the avoidable deaths of 82 generally poor persons of (mainly) color due to official negligence by the richest council in Britain will become obscured in the mists of time before the next General Election or Prime Minister May gets swept away into the vortex of BREXIT – whichever comes first. American Task Force aficionados doubtless are green with envy. Practice makes perfect. The Old World still has something to teach the New about the fine points of the Portuguese Lift. This is not to say that Americans are naifs when it comes to whitewashes. Power itself generates a strong impulse to conceal and to dissemble when potentially embarrassing matters arise. The 9/11 Commission is the most striking example. This elephantine enterprise (itself a safe sign that nothing incisive will result) birthed a meek little mouse. The firm consensus of the bipartisan membership was that nobody had done anything wrong – that is to say, no American in an official capacity. Blame was placing exclusively on Osama bin-Laden and al-Qaida. The fix was in on day one when the co-chairs (former Republican Governor Thomas Keane and former Democratic Congressman Lee Hamilton) sealed a deal to offer official immunity to both the Clinton and Bush administrations. It was pretty blatant. Appointed as staff director was Phillip Zelikow – long-time friend, colleague, and co-author of then National Security Advisor Condoleezza Rice. He routinely announced breaks in the discussions to talk to her on a secure personal line from the patio outside the meeting room. Even the English grandees show more discretion than that. The 9/11 Commission did serve an overriding purpose: to prevent the fury and thirst for revenge from being diverted onto domestic targets. Thus, it could be fully mobilized to carry on the War On Terror, i.e. to assuage anger by going to the Middle East to get ourselves a bunch of A-rabs. The key to “getting away with” a Portuguese Lift is to give a convincing appearance of intense, earnest effort. Here are some recommendations to TF heads for achieving that effect. Always move briskly and with measured determination. Speak the same way. Languid movements or laconic speech are to be avoided. If you are too aged or infirm to walk briskly for long distances, have yourself videoed descending an imposing staircase. To give an impression of activity, carry a sheath of loose folders along with your attache case. This suggests that you just finished an important hands-on meeting and now are rushing to the next appointment. This gesture is called the ‘Greenspan Variation.’ Also, leave your trench coat unbuttoned so that it flaps in the breeze. Quell any reports of family or personal life. You are all business. Appear at work venues at odd times – nights, weekends, Super Bowl Sunday. Stay clear of reporters other than to state curtly that you will inform them of important developments in due course as circumstances dictate. Cultivate that heavy silence which commands. A somewhat gaunt appearance is preferred (see Robert Mueller) but show no sign of weakness or illness. Try staying up late to watch LeBron’s Lakers play the Warriors or force yourself to listen to Nikki Haley and Mike Pompeo rants on CSPAN.